We tend to think that if we only had more information we’d make better decisions. The world, however, doesn’t always work that way. Paradoxically, More information often means that we make worse decisions. One of the reasons we make worse decisions with more information is that we pursue information that appears relevant but isn’t. The harder the information is to find—that is the more work we have to do in order to find it and the more exclusive is it—the more psychology tells us that we’ll put too much value on that information. In part, this happens because of our bias toward commitment and consistency; we’ve spent time and effort seeking out that information, so mentally we feel obliged to use it. This nudges us toward decisions we otherwise wouldn’t have made. We also over-value information that is easily obtainable, thinking that it posssesses unique insights when in fact it’s nothing more than you’d find on the first page of Google. A little knowledge truly is a dangerous thing. 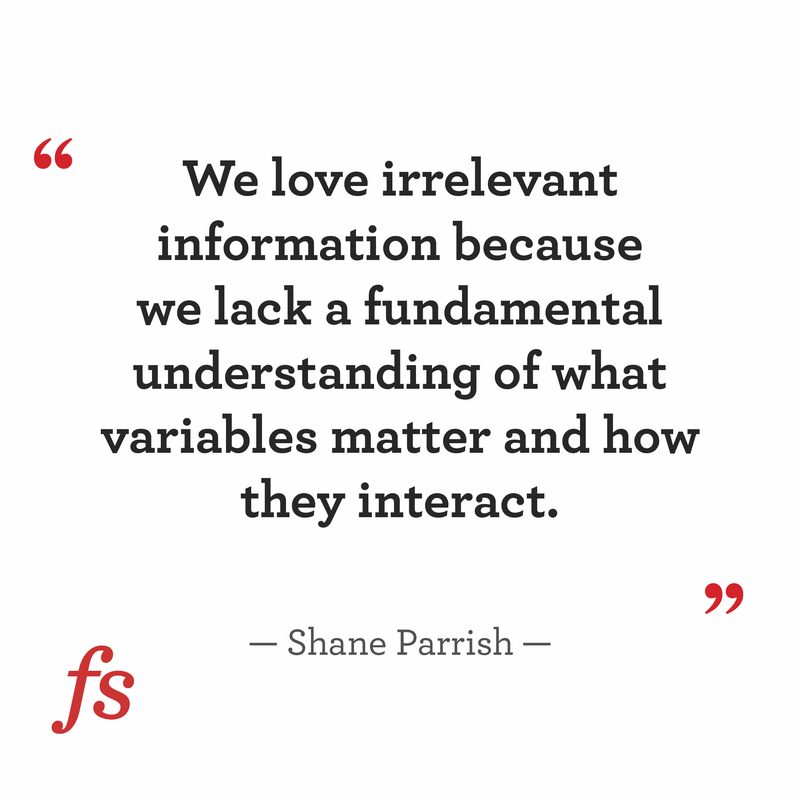 And yet, another reason we love irrelevant information is that we really lack fundamental understanding. If we don’t understand something, we won’t have a firm grasp of the fundamental variables that govern the situation and how they interact, so we’ll look for new variables. When you’re not sure how to weigh one attribute compared with another, you end up searching for a reason. Often this mountain of new information — even if easily obtainable – is largely irrelevant to the situation. The problem is we don’t know it is irrelevant. Decisions are hard to make. In part this is because of conflict and uncertainty. We are uncertain of the consequences of our actions and have difficulty making tradeoffs between attributes. Just as knowledge can make decision making easier, a lack of knowledge compounds the problem. When faced with two choices of equal alternatives, Slovic (1975, 1990) suggests we make choices based on what’s easy to explain and justify. Sounds logical, right, why flip a coin when I can come up with a reason. Sometimes we weigh the pros and cons. Subconsciously, when deciding for something, we focus on the pros and when we decide against something we focus on the reasons for rejection. This has the added advantage of giving us a good story to tell but causes problems when there are no striking positive or negative aspects to help make the decision. When we can’t find a compelling reason to do something or avoid something, we are left in a state of conflict. So we search for more information. The implications of my cobbled together theory seem worth considering. If our current choices don’t give us a convincing reason to opt for a choice we’ll likely seek out additional information (rather than questioning our understanding). When we do seek out additional information, we’re really just looking for a compelling rationale for choosing one alternative over another.